There is an expression: the Malaysian way of doing things. In recent years, another expression became popular: Malaysia Boleh! (meaning Malaysia can or is able to do it). It has been used by the public to describe everything from the good to the bad and especially government behaviour that irks the public. I think the Malaysian way stems from the complexity of the multi-racial and multi-religious population of Malaysia. Compromise (in a good sense) has been a way of life in Malaysia. At the political level, the government that ruled the country since Independence is a coalition government drawn from different races and founded on the approach of give-and-take. Most of us grew up with friends from other races and we have co-existed happily until race-based politics reared its ugly head from the 1980s onwards. In my previous posts, I had described how imports as well as local printing of the Al-Kitab had been restricted by the Federal Government. In mid-2005, then Prime Minister Abdullah Badawi ordered the release of BSM’s 1,000 Al-Kitabs detained by the Government and issued a letter to the effect that all future copies of the Al-Kitab that are brought into the country must carry on its cover the symbol of the cross and the words “Penerbitan Christian” (Christian Publication). In spite of this, the next shipment of 5,000 Al-Kitabs imported by BSM with the cross and words on its cover was detained at Port Kelang by the Home Ministry (KDN) on 23 March 2009. Appeals and complaints were made to the KDN. From time to time, there were rumours of the release of the bibles but none them were founded. In early March, 2011, BSM called the churches to pray for the release of the bibles to mark the approaching second anniversary of its detention. This call coincided with the campaigning for the Sarawak state election due in early April. The issue was picked up by the press and the opposition parties. The Christian Federation of Malaysia (CFM) through its head, Bishop Ng Moon Hing, issued a strongly worded protest. Very quickly, the detention of the bibles became a national issue as well as a campaign issue in Sarawak. Thoroughly embarrassed and fearful of losing Sarawak which had a significant Christian majority, the Federal government appointed Senator Idris Jala to handle the crisis. Idris is a Christian native of Sarawak. Before he joined the government, he was a corporate superstar having served in Shell worldwide and then turning Malaysian Airlines back into the black. On 12 March 2011, Idris called CFM and informed them that the Prime Minister Najib Razak had ordered the Home Minister to release the 5,000 Al-Kitabs held in Port Klang and 30,000 BM Bible Portions imported by the Gideons held in Kuching port. CFM is an umbrella body set up to represent the Christian community to the Government. It has 3 component bodies: the Roman Catholics, the Council of Churches Malaysia (CCM) and the National Evangelical Christian Fellowship (NECF). CCM is the umbrella body for the mainline Protestant churches and NECF represents the newer evangelical denominations. On 14 March 2011, I was invited to attend a meeting between Idris and CFM. I was representing BSM whose bibles had been detained. Idris briefed the meeting about his involvement in this issue and the PM’s order to release the bibles. He said that a letter to inform BSM about the release of the bibles will be issued by KDN within the next few days and that future imports of Al-Kitabs are subject to the conditions laid down by Abdullah Badawi in 2005. He also stressed that the issue of the Al-Kitab must be kept separate from that of the Herald case. The next day, Idris announced in the press the Government’s decision to release the bibles. Later that evening, BSM received a letter from KDN Putrajaya informing us that the bibles will be released but that it must be stamped and serialised. A sample of the stamp was attached to the letter. We immediately decided to reject this condition to stamp our bibles and prepared our reply while at the same time informing CFM of this condition that had never surfaced in the meeting with Idris. The purpose of the stamp was obvious. It was a means to track buyers of the bibles. Any of these bibles that end up in the hands of a Muslim can then be traced back to the original buyer. Once Christians learn about this, no one would buy our bibles. This would kill off the distribution of the Al-Kitab in the country considering the fact that BSM is the sole producer and importer of the Al-Kitab. “Yes. No need for you to do it. We did it for you already,” came the reply. “No, I am not going to collect. I am going to inform CFM and we are going to complain,” I said as I slammed the phone down. 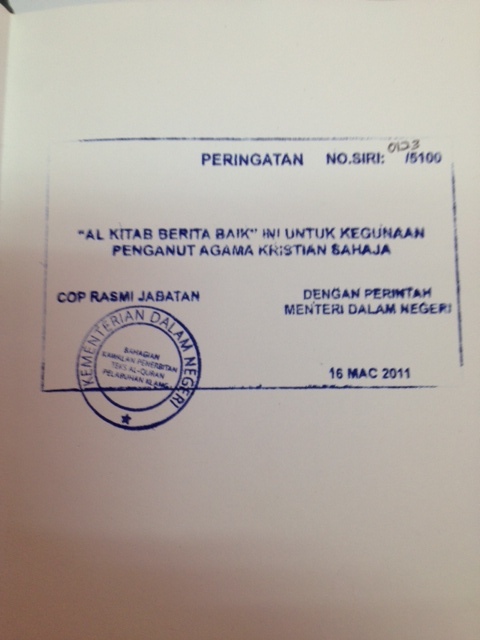 An example of the stamp with serial number made on every one of the 5,000 Al-Kitabs. Within the hour, I released a press statement saying that the Government had desecrated our holy books. Then all hell broke loose! BSM will not write to AG. BSM was raided by JAIS, a Selangor government department. The bibles are held by JAIS in their office in Shah Alam, a stone’s throw from the Menteri Besar’s office. This problem was caused by a department of the Selangor State Government. It was an assault by Selangor State authorities against the rights of the Christian community in Selangor. It is the responsibility of the Selangor State Government to correct this unjust situation and BSM will not be party to Khalid’s attempt to dump his rubbish in somebody else’ backyard. The Federal Government has given the Ten Points Solution in 2011 that allowed Christians to import, print and distribute the Alkitab throughout Malaysia. In reliance on the Ten Points, BSM has imported the Alkitab on many occasions over the past 2 years and the Federal Government has faithfully honoured the Ten Points when they ensured that each shipment of bibles were promptly cleared and released without delay. The action of JAIS in raiding BSM and the Selangor State Exco washing their hands off their responsibility today is a clear statement to the people of Selangor that the Government of Selangor rejects the Ten Points Solution and that it does not intend to accord Christians in Selangor as well as the rest of Malaysia access to their holy books in the national language.